Adults have white under parts, though the rest of the plumage goes through a complex molting process. The male has a long pointed tail 6” – 8” and a dark grey bill crossed by a pink band. In winter, the male has a dark cheek patch on a mainly white head and neck, a dark breast and mostly white body. In summer, the male is dark on the head, neck and back with a white cheek patch. The female has a brown back and a relatively short pointed tail. In winter, the female’s head and neck are white with a dark crown. In summer, the head is dark. They’re quite gregarious, forming large flocks in winter and during migration. 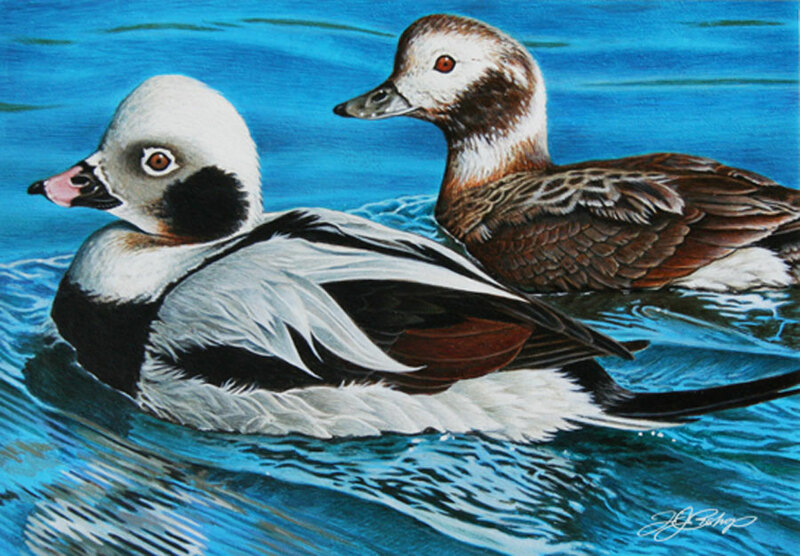 I depicted this pair of long tails, in their breeding plumage. When they’re in their molting, or eclipse plumage they are considerably more drab, only having their long tales as easy indicators of their species.